This is “A Brief History of Macroeconomic Thought and Policy”, chapter 17 from the book Macroeconomics Principles (v. 1.1). For details on it (including licensing), click here. It is the 1930s. Many people have begun to wonder if the United States will ever escape the Great Depression’s cruel grip. Forecasts that prosperity lies just around the corner take on a hollow ring. The collapse seems to defy the logic of the dominant economic view—that economies should be able to reach full employment through a process of self-correction. The old ideas of macroeconomics do not seem to work, and it is not clear what new ideas should replace them. In Britain, Cambridge University economist John Maynard Keynes is struggling with ideas that he thinks will stand the conventional wisdom on its head. He is confident that he has found the key not only to understanding the Great Depression but also to correcting it. It is the 1960s. Most economists believe that Keynes’s ideas best explain fluctuations in economic activity. The tools Keynes suggested have won widespread acceptance among governments all over the world; the application of expansionary fiscal policy in the United States appears to have been a spectacular success. But economist Milton Friedman of the University of Chicago continues to fight a lonely battle against what has become the Keynesian orthodoxy. He argues that money, not fiscal policy, is what affects aggregate demand. He insists not only that fiscal policy cannot work, but that monetary policy should not be used to move the economy back to its potential output. He counsels a policy of steady money growth, leaving the economy to adjust to long-run equilibrium on its own. It is 1970. The economy has just taken a startling turn: Real GDP has fallen, but inflation has remained high. A young economist at Carnegie–Mellon University, Robert E. Lucas, Jr., finds this a paradox, one that he thinks cannot be explained by Keynes’s theory. Along with several other economists, he begins work on a radically new approach to macroeconomic thought, one that will challenge Keynes’s view head-on. Lucas and his colleagues suggest a world in which self-correction is swift, rational choices by individuals generally cancel the impact of fiscal and monetary policies, and stabilization efforts are likely to slow economic growth. John Maynard Keynes, Milton Friedman, and Robert E. Lucas, Jr., each helped to establish a major school of macroeconomic thought. Although their ideas clashed sharply, and although there remains considerable disagreement among economists about a variety of issues, a broad consensus among economists concerning macroeconomic policy began to emerge in the 1980s and 1990s. That consensus has sharply affected macroeconomic policy. And the improved understanding that has grown out of the macroeconomic debate has had dramatic effects on fiscal and on monetary policy. In this chapter we will examine the macroeconomic developments of five decades: the 1930s, 1960s, 1970s, 1980s, and 1990s. We will use the aggregate demand–aggregate supply model to explain macroeconomic changes during these periods, and we will see how the three major economic schools were affected by these events. We will also see how these schools of thought affected macroeconomic policy. Finally, we will see how the evolution of macroeconomic thought and policy is influencing how economists design policy prescriptions for dealing with the current recession, which many feel has the potential to be the largest since the Great Depression. In examining the ideas of these schools, we will incorporate concepts such as the potential output and the natural level of employment. While such terms had not been introduced when some of the major schools of thought first emerged, we will use them when they capture the ideas economists were presenting. Explain the basic assumptions of the classical school of thought that dominated macroeconomic thinking before the Great Depression, and tell why the severity of the Depression struck a major blow to this view. Compare Keynesian and classical macroeconomic thought, discussing the Keynesian explanation of prolonged recessionary and inflationary gaps as well as the Keynesian approach to correcting these problems. It is hard to imagine that anyone who lived during the Great Depression was not profoundly affected by it. From the beginning of the Depression in 1929 to the time the economy hit bottom in 1933, real GDP plunged nearly 30%. Real per capita disposable income sank nearly 40%. More than 12 million people were thrown out of work; the unemployment rate soared from 3% in 1929 to 25% in 1933. Some 85,000 businesses failed. Hundreds of thousands of families lost their homes. By 1933, about half of all mortgages on all urban, owner-occupied houses were delinquent.David C. Wheelock, “The Federal Response to Home Mortgage Distress: Lessons from the Great Depression,” Federal Reserve Bank of St. Louis Review 90, no. 3 (Part 1) (May/June 2008): 133–48. The economy began to recover after 1933, but a huge recessionary gap persisted. Another downturn began in 1937, pushing the unemployment rate back up to 19% the following year. 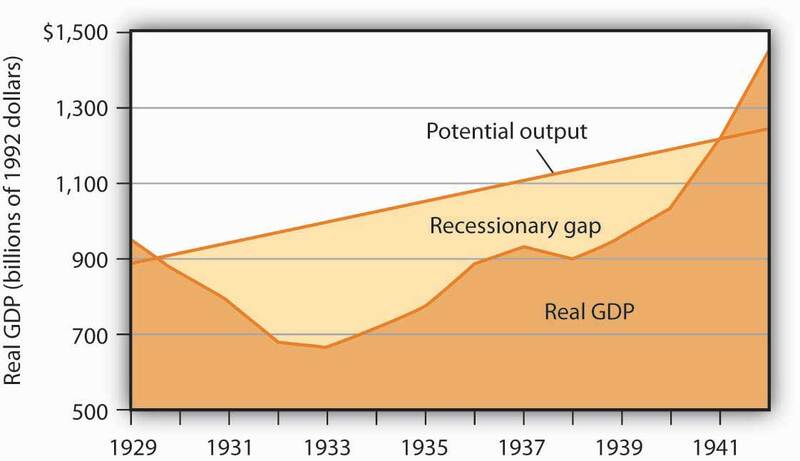 Figure 17.1 "The Depression and the Recessionary Gap" shows the course of real GDP compared to potential output during the Great Depression. The economy did not approach potential output until 1941, when the pressures of world war forced sharp increases in aggregate demand. The dark-shaded area shows real GDP from 1929 to 1942, the upper line shows potential output, and the light-shaded area shows the difference between the two—the recessionary gap. The gap nearly closed in 1941; an inflationary gap had opened by 1942. The chart suggests that the recessionary gap remained very large throughout the 1930s. The Great Depression came as a shock to what was then the conventional wisdom of economics. To see why, we must go back to the classical tradition of macroeconomics that dominated the economics profession when the Depression began. Classical economicsThe body of macroeconomic thought, associated primarily with nineteenth-century British economist David Ricardo, that focused on the long run and on the forces that determine and produce growth in an economy’s potential output. 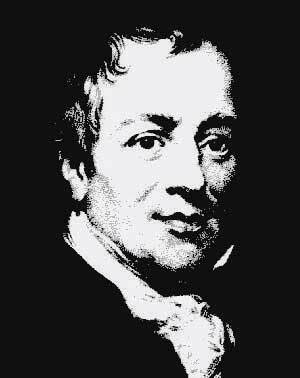 is the body of macroeconomic thought associated primarily with 19th-century British economist David Ricardo. His Principles of Political Economy and Taxation, published in 1817, established a tradition that dominated macroeconomic thought for over a century. Ricardo focused on the long run and on the forces that determine and produce growth in an economy’s potential output. He emphasized the ability of flexible wages and prices to keep the economy at or near its natural level of employment. According to the classical school, achieving what we now call the natural level of employment and potential output is not a problem; the economy can do that on its own. Classical economists recognized, however, that the process would take time. Ricardo admitted that there could be temporary periods in which employment would fall below the natural level. But his emphasis was on the long run, and in the long run all would be set right by the smooth functioning of the price system. Economists of the classical school saw the massive slump that occurred in much of the world in the late 1920s and early 1930s as a short-run aberration. The economy would right itself in the long run, returning to its potential output and to the natural level of employment. In Britain, which had been plunged into a depression of its own, John Maynard Keynes had begun to develop a new framework of macroeconomic analysis, one that suggested that what for Ricardo were “temporary effects” could persist for a long time, and at terrible cost. Keynes’s 1936 book, The General Theory of Employment, Interest and Money, was to transform the way many economists thought about macroeconomic problems. In a nutshell, we can say that Keynes’s book shifted the thrust of macroeconomic thought from the concept of aggregate supply to the concept of aggregate demand. Ricardo’s focus on the tendency of an economy to reach potential output inevitably stressed the supply side—an economy tends to operate at a level of output given by the long-run aggregate supply curve. Keynes, in arguing that what we now call recessionary or inflationary gaps could be created by shifts in aggregate demand, moved the focus of macroeconomic analysis to the demand side. He argued that prices in the short run are quite sticky and suggested that this stickiness would block adjustments to full employment. Keynes’s work spawned a new school of macroeconomic thought, the Keynesian school. Keynesian economicsThe body of macroeconomic thought that asserts that changes in aggregate demand can create gaps between the actual and potential levels of output, and that such gaps can be prolonged. It stresses the use of fiscal and monetary policy to close such gaps. asserts that changes in aggregate demand can create gaps between the actual and potential levels of output, and that such gaps can be prolonged. Keynesian economists stress the use of fiscal and of monetary policy to close such gaps. The experience of the Great Depression certainly seemed consistent with Keynes’s argument. A reduction in aggregate demand took the economy from above its potential output to below its potential output, and, as we saw in Figure 17.1 "The Depression and the Recessionary Gap", the resulting recessionary gap lasted for more than a decade. While the Great Depression affected many countries, we shall focus on the U.S. experience. The plunge in aggregate demand began with a collapse in investment. The investment boom of the 1920s had left firms with an expanded stock of capital. As the capital stock approached its desired level, firms did not need as much new capital, and they cut back investment. The stock market crash of 1929 shook business confidence, further reducing investment. Real gross private domestic investment plunged nearly 80% between 1929 and 1932. We have learned of the volatility of the investment component of aggregate demand; it was very much in evidence in the first years of the Great Depression. Other factors contributed to the sharp reduction in aggregate demand. The stock market crash reduced the wealth of a small fraction of the population (just 5% of Americans owned stock at that time), but it certainly reduced the consumption of the general population. The stock market crash also reduced consumer confidence throughout the economy. The reduction in wealth and the reduction in confidence reduced consumption spending and shifted the aggregate demand curve to the left. Fiscal policy also acted to reduce aggregate demand. As consumption and income fell, governments at all levels found their tax revenues falling. They responded by raising tax rates in an effort to balance their budgets. The federal government, for example, doubled income tax rates in 1932. Total government tax revenues as a percentage of GDP shot up from 10.8% in 1929 to 16.6% in 1933. Higher tax rates tended to reduce consumption and aggregate demand. Other countries were suffering declining incomes as well. Their demand for U.S. goods and services fell, reducing the real level of exports by 46% between 1929 and 1933. The Smoot–Hawley Tariff Act of 1930 dramatically raised tariffs on products imported into the United States and led to retaliatory trade-restricting legislation around the world. This act, which more than 1,000 economists opposed in a formal petition, contributed to the collapse of world trade and to the recession. As if all this were not enough, the Fed, in effect, conducted a sharply contractionary monetary policy in the early years of the Depression. The Fed took no action to prevent a wave of bank failures that swept the country at the outset of the Depression. Between 1929 and 1933, one-third of all banks in the United States failed. As a result, the money supply plunged 31% during the period. The Fed could have prevented many of the failures by engaging in open-market operations to inject new reserves into the system and by lending reserves to troubled banks through the discount window. But it generally refused to do so; Fed officials sometimes even applauded bank failures as a desirable way to weed out bad management! Slumping aggregate demand brought the economy well below the full-employment level of output by 1933. The short-run aggregate supply curve increased as nominal wages fell. In this analysis, and in subsequent applications in this chapter of the model of aggregate demand and aggregate supply to macroeconomic events, we are ignoring shifts in the long-run aggregate supply curve in order to simplify the diagram. 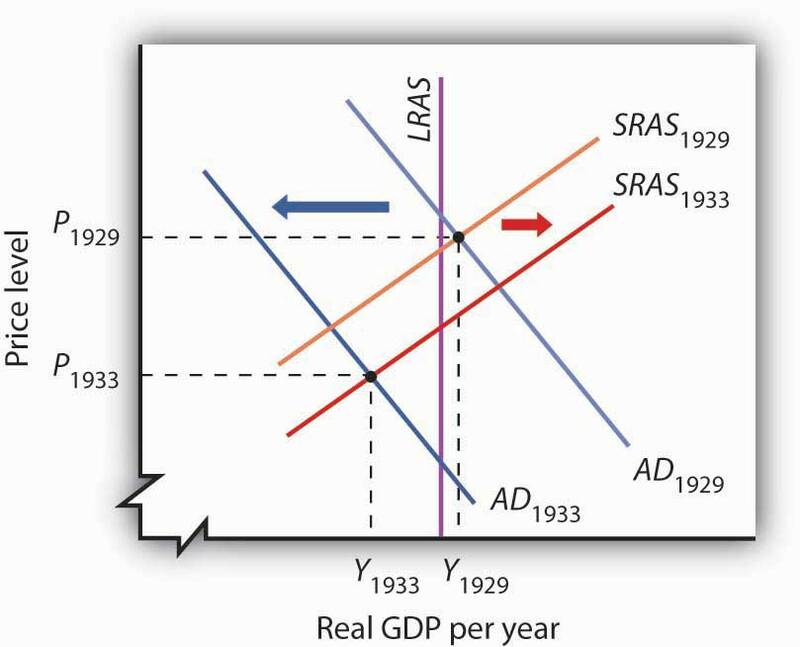 Figure 17.2 "Aggregate Demand and Short-Run Aggregate Supply: 1929–1933" shows the shift in aggregate demand between 1929, when the economy was operating just above its potential output, and 1933. The plunge in aggregate demand produced a recessionary gap. Our model tells us that such a gap should produce falling wages, shifting the short-run aggregate supply curve to the right. That happened; nominal wages plunged roughly 20% between 1929 and 1933. But we see that the shift in short-run aggregate supply was insufficient to bring the economy back to its potential output. The failure of shifts in short-run aggregate supply to bring the economy back to its potential output in the early 1930s was partly the result of the magnitude of the reductions in aggregate demand, which plunged the economy into the deepest recessionary gap ever recorded in the United States. 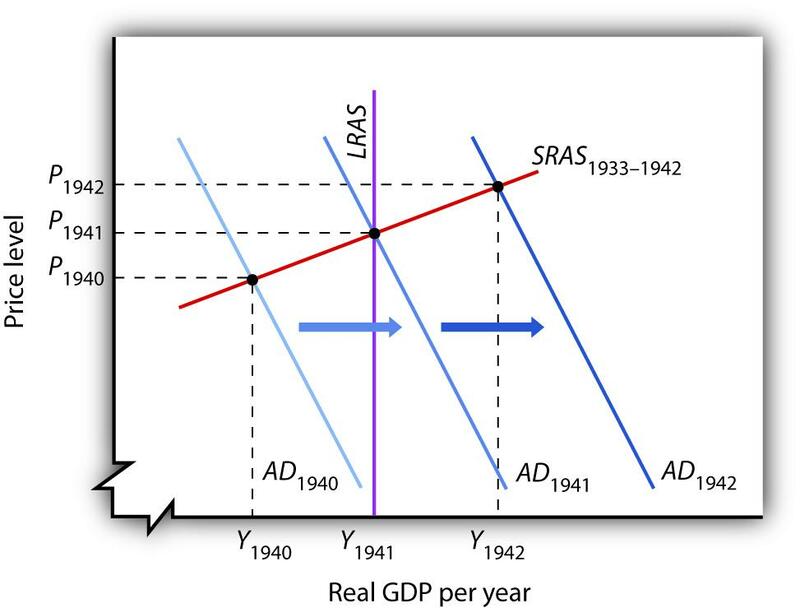 We know that the short-run aggregate supply curve began shifting to the right in 1930 as nominal wages fell, but these shifts, which would ordinarily increase real GDP, were overwhelmed by continued reductions in aggregate demand. A further factor blocking the economy’s return to its potential output was federal policy. President Franklin Roosevelt thought that falling wages and prices were in large part to blame for the Depression; programs initiated by his administration in 1933 sought to block further reductions in wages and prices. That stopped further reductions in nominal wages in 1933, thus stopping further shifts in aggregate supply. With recovery blocked from the supply side, and with no policy in place to boost aggregate demand, it is easy to see now why the economy remained locked in a recessionary gap so long. Keynes argued that expansionary fiscal policy represented the surest tool for bringing the economy back to full employment. The United States did not carry out such a policy until world war prompted increased federal spending for defense. New Deal policies did seek to stimulate employment through a variety of federal programs. But, with state and local governments continuing to cut purchases and raise taxes, the net effect of government at all levels on the economy did not increase aggregate demand during the Roosevelt administration until the onset of world war.For a discussion of fiscal policy during the Great Depression, see E. Cary Brown, “Fiscal Policy in the ’Thirties: A Reappraisal,” American Economic Review 46, no. 5 (December 1956): 857–79. As Figure 17.3 "World War II Ends the Great Depression" shows, expansionary fiscal policies forced by the war had brought output back to potential by 1941. The U.S. entry into World War II after Japan’s attack on American forces in Pearl Harbor in December of 1941 led to much sharper increases in government purchases, and the economy pushed quickly into an inflationary gap. Increased U.S. government purchases, prompted by the beginning of World War II, ended the Great Depression. By 1942, increasing aggregate demand had pushed real GDP beyond potential output. For Keynesian economists, the Great Depression provided impressive confirmation of Keynes’s ideas. A sharp reduction in aggregate demand had gotten the trouble started. The recessionary gap created by the change in aggregate demand had persisted for more than a decade. And expansionary fiscal policy had put a swift end to the worst macroeconomic nightmare in U.S. history—even if that policy had been forced on the country by a war that would prove to be one of the worst episodes of world history. Classical economic thought stressed the ability of the economy to achieve what we now call its potential output in the long run. It thus stressed the forces that determine the position of the long-run aggregate supply curve as the determinants of income. Keynesian economics focuses on changes in aggregate demand and their ability to create recessionary or inflationary gaps. Keynesian economists argue that sticky prices and wages would make it difficult for the economy to adjust to its potential output. Because Keynesian economists believe that recessionary and inflationary gaps can persist for long periods, they urge the use of fiscal and monetary policy to shift the aggregate demand curve and to close these gaps. Aggregate demand fell sharply in the first four years of the Great Depression. As the recessionary gap widened, nominal wages began to fall, and the short-run aggregate supply curve began shifting to the right. These shifts, however, were not sufficient to close the recessionary gap. World War II forced the U.S. government to shift to a sharply expansionary fiscal policy, and the Depression ended. Imagine that it is 1933. President Franklin Roosevelt has just been inaugurated and has named you as his senior economic adviser. Devise a program to bring the economy back to its potential output. 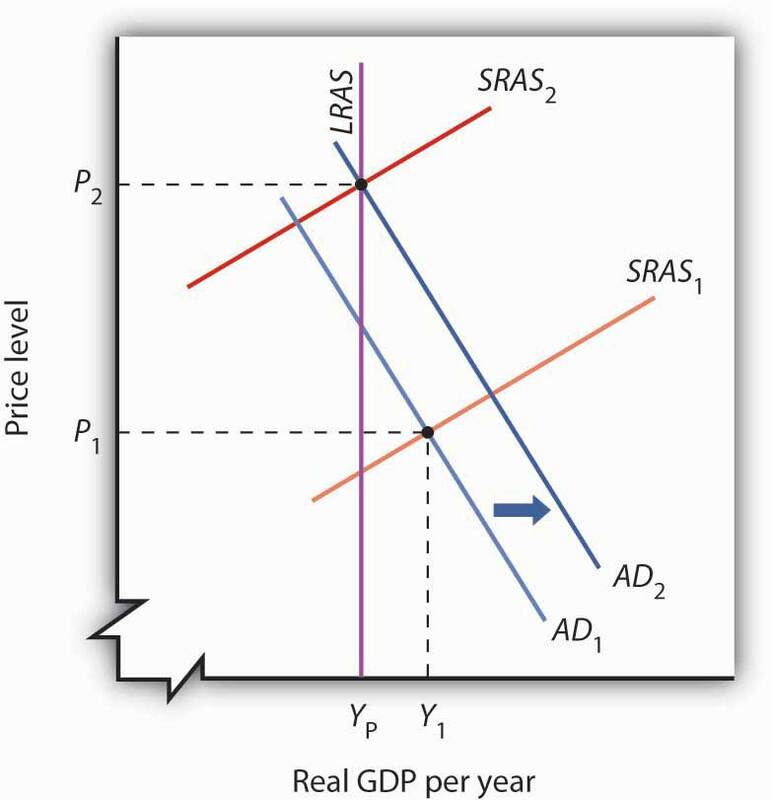 Using the model of aggregate demand and aggregate supply, demonstrate graphically how your proposal could work. Although David Ricardo’s focus on the long run emerged as the dominant approach to macroeconomic thought, not all of his contemporaries agreed with his perspective. Many eighteenth- and nineteenth-century economists developed theoretical arguments suggesting that changes in aggregate demand could affect the real level of economic activity in the short run. Like the new Keynesians, they based their arguments on the concept of price stickiness. Hume’s argument implies sticky prices; some prices are slower to respond to the increase in the money supply than others. Source: Thomas M. Humphrey, “Nonneutrality of Money in Classical Monetary Thought,” Federal Reserve Bank of Richmond Economic Review 77, no. 2 (March/April 1991): 3–15, and personal interview. 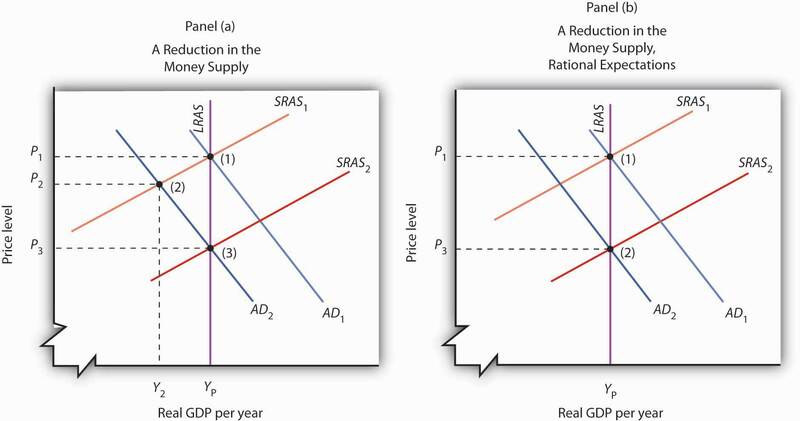 An expansionary fiscal or monetary policy, or a combination of the two, would shift aggregate demand to the right as shown in Panel (a), ideally returning the economy to potential output. One piece of evidence suggesting that fiscal policy would work is the swiftness with which the economy recovered from the Great Depression once World War II forced the government to carry out such a policy. An alternative approach would be to do nothing. Ultimately, that should force nominal wages down further, producing increases in short-run aggregate supply, as in Panel (b). We do not know if such an approach might have worked; federal policies enacted in 1933 prevented wages and prices from falling further than they already had. Discuss how the Fed incorporated a strong inflation constraint and lags into its policies from the 1980s onwards. Describe the fiscal policies that were undertaken from the 1980s onwards and their rationales. Discuss the challenges that events from the 1980s onwards raised for the monetarist and new classical schools of thought. Summarize the views and policy approaches of the new Keynesian school of economic thought. The last two decades of the twentieth century brought progress in macroeconomic policy and in macroeconomic theory. The outlines of a broad consensus in macroeconomic theory began to take shape in the 1980s. This consensus has grown out of the three bodies of macroeconomic thought that, in turn, grew out of the experiences of the twentieth century. Keynesian economics, monetarism, and new classical economics all developed from economists’ attempts to understand macroeconomic change. We shall see how all three schools of macroeconomic thought have contributed to the development of a new school of macroeconomic thought: the new Keynesian school. New Keynesian economicsA body of macroeconomic thought that stresses the stickiness of prices and the need for activist stabilization policies through the manipulation of aggregate demand to keep the economy operating close to its potential output. It incorporates monetarist ideas about the importance of monetary policy and new classical ideas about the importance of aggregate supply, both in the long run and in the short run. is a body of macroeconomic thought that stresses the stickiness of prices and the need for activist stabilization policies through the manipulation of aggregate demand to keep the economy operating close to its potential output. It incorporates monetarist ideas about the importance of monetary policy and new classical ideas about the importance of aggregate supply, both in the long and in the short run. Another “new” element in new Keynesian economic thought is the greater use of microeconomic analysis to explain macroeconomic phenomena, particularly the analysis of price and wage stickiness. We saw in the chapter that introduced the model of aggregate demand and aggregate supply, for example, that sticky prices and wages may be a response to the preferences of consumers and of firms. That idea emerged from research by economists of the new Keynesian school. New Keynesian ideas guide macroeconomic policy; they are the basis for the model of aggregate demand and aggregate supply with which we have been working. To see how the new Keynesian school has come to dominate macroeconomic policy, we shall review the major macroeconomic events and policies of the 1980s, 1990s, and early 2000s. The exercise of monetary and of fiscal policy has changed dramatically in the last few decades. It is fair to say that the monetary policy revolution of the last two decades began on July 25, 1979. On that day, President Jimmy Carter appointed Paul Volcker to be chairman of the Fed’s Board of Governors. Mr. Volcker, with President Carter’s support, charted a new direction for the Fed. The new direction damaged Mr. Carter politically but ultimately produced dramatic gains for the economy. Oil prices rose sharply in 1979 as war broke out between Iran and Iraq. Such an increase would, by itself, shift the short-run aggregate supply curve to the left, causing the price level to rise and real GDP to fall. But expansionary fiscal and monetary policies had pushed aggregate demand up at the same time. As a result, real GDP stayed at potential output, while the price level soared. The implicit price deflator jumped 8.1%; the CPI rose 13.5%, the highest inflation rate recorded in the twentieth century. Public opinion polls in 1979 consistently showed that most people regarded inflation as the leading problem facing the nation. By 1979, expansionary fiscal and monetary policies had brought the economy to its potential output. Then war between Iran and Iraq caused oil prices to increase, shifting the short-run aggregate supply curve to the left. In the second half of 1979, the Fed launched an aggressive contractionary policy aimed at reducing inflation. The Fed’s action shifted the aggregate demand curve to the left. The result in 1980 was a recession with continued inflation. Chairman Volcker charted a monetarist course of fixing the growth rate of the money supply at a rate that would bring inflation down. After the high rates of money growth of the past, the policy was sharply contractionary. Its first effects were to shift the aggregate demand curve to the left. Continued oil price increases produced more leftward shifts in the short-run aggregate supply curve, and the economy suffered a recession in 1980. Inflation remained high. 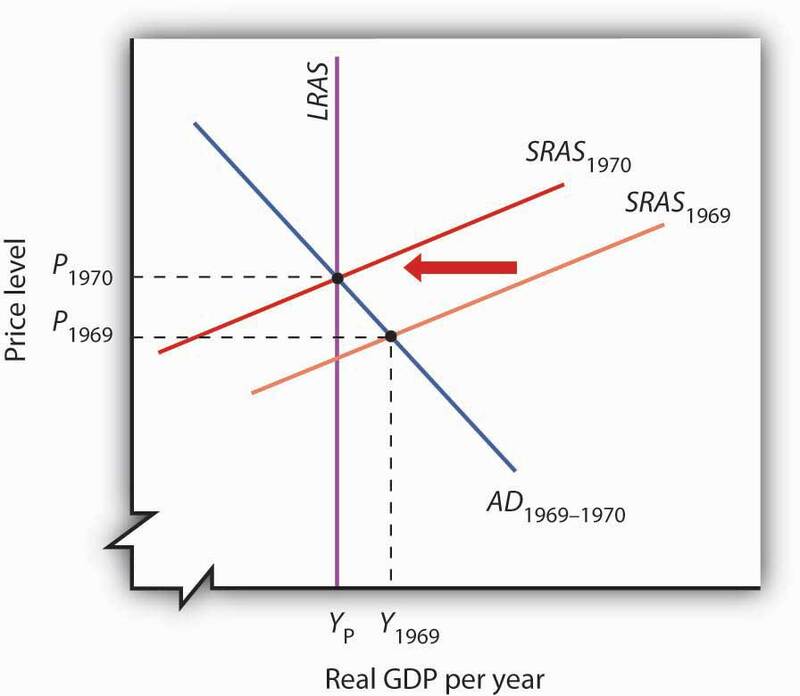 Figure 17.12 "The Fed’s Fight Against Inflation" shows how the combined shifts in aggregate demand and short-run aggregate supply produced a reduction in real GDP and an increase in the price level. The Fed stuck to its contractionary guns, and the inflation rate finally began to fall in 1981. But the recession worsened. Unemployment soared, shooting above 10% late in the year. It was the worst recession since the Great Depression. The inflation rate, though, fell sharply in 1982, and the Fed began to shift to a modestly expansionary policy in 1983. But inflation had been licked. Inflation, measured by the implicit price deflator, dropped to a 4.1% rate that year, the lowest since 1967. The Fed’s actions represented a sharp departure from those of the previous two decades. Faced with soaring unemployment, the Fed did not shift to an expansionary policy until inflation was well under control. Inflation continued to edge downward through most of the remaining years of the 20th century and into the new century. The Fed has clearly shifted to a stabilization policy with a strong inflation constraint. It shifts to expansionary policy when the economy has a recessionary gap, but only if it regards inflation as being under control. This concern about inflation was evident again when the U.S. economy began to weaken in 2008, and there was initially discussion among the members of the Federal Open Market Committee about whether or not easing would contribute to inflation. At that time, it looked like inflation was becoming a more serious problem, largely due to increases in oil and other commodity prices. Some members of the Fed, including Chairman Bernanke, argued that these price increases were likely to be temporary and the Fed began using expansionary monetary policy early on. By late summer and early fall, inflationary pressures had subsided, and all the members of the FOMC were behind continued expansionary policy. Indeed, at that point, the Fed let it be known that it was willing to do anything in its power to fight the current recession. The next major advance in monetary policy came in the 1990s, under Federal Reserve Chairman Alan Greenspan. The Fed had shifted to an expansionary policy as the economy slipped into a recession when Iraq’s invasion of Kuwait in 1990 began the Persian Gulf War and sent oil prices soaring. By early 1994, real GDP was rising, but the economy remained in a recessionary gap. Nevertheless, the Fed announced on February 4, 1994, that it had shifted to a contractionary policy, selling bonds to boost interest rates and to reduce the money supply. While the economy had not reached its potential output, Chairman Greenspan explained that the Fed was concerned that it might push past its potential output within a year. The Fed, for the first time, had explicitly taken the impact lag of monetary policy into account. The issue of lags was also a part of Fed discussions in the 2000s. President Ronald Reagan, whose 1980 election victory was aided by a recession that year, introduced a tax cut, combined with increased defense spending, in 1981. While this expansionary fiscal policy was virtually identical to the policy President Kennedy had introduced 20 years earlier, President Reagan rejected Keynesian economics, embracing supply-side arguments instead. He argued that the cut in tax rates, particularly in high marginal rates, would encourage work effort. He reintroduced an investment tax credit, which stimulated investment. With people working harder and firms investing more, he expected long-run aggregate supply to increase more rapidly. His policy, he said, would stimulate economic growth. The tax cut and increased defense spending increased the federal deficit. Increased spending for welfare programs and unemployment compensation, both of which were induced by the plunge in real GDP in the early 1980s, contributed to the deficit as well. As deficits continued to rise, they began to dominate discussions of fiscal policy. In 1990, with the economy slipping into a recession, President George H. W. Bush agreed to a tax increase despite an earlier promise not to do so. President Bill Clinton, whose 1992 election resulted largely from the recession of 1990–1991, introduced another tax increase in 1994, with the economy still in a recessionary gap. Both tax increases were designed to curb the rising deficit. Congress in the first years of the 1990s rejected the idea of using an expansionary fiscal policy to close a recessionary gap on grounds it would increase the deficit. President Clinton, for example, introduced a stimulus package of increased government investment and tax cuts designed to stimulate private investment in 1993; a Democratic Congress rejected the proposal. The deficit acted like a straitjacket for fiscal policy. The Bush and Clinton tax increases, coupled with spending restraint and increased revenues from economic growth, brought an end to the deficit in 1998. Initially, it was expected that the budget surplus would continue well into the new century. But, this picture changed rapidly. President George W. Bush campaigned on a platform of large tax cuts, arguing that less government intervention in the economy would be good for long-term economic growth. His administration saw the enactment of two major pieces of tax-cutting legislation in 2001 and 2003. Coupled with increases in government spending, in part for defense but also for domestic purposes including a Medicare prescription drug benefit, the government budget surpluses gave way to budget deficits. To deal with times of economic weakness during President Bush’s administration, temporary tax cuts were enacted, both in 2001 and again in 2008. As the economy continued to weaken in 2008, there seemed to be a resurgence of interest in using discretionary increases in government spending, as discussed in the Case in Point, to respond to the recession. Three factors were paramount: (1) the temporary tax cuts had provided only a minor amount of stimulus to the economy, as sizable portions had been used for saving rather than spending, (2) expansionary monetary policy, while useful, had not seemed adequate, and (3) the recession threatening the global economy seemed to be larger than those in recent economic history. New Keynesian economics emerged in the last three decades as the dominant school of macroeconomic thought for two reasons. First, it successfully incorporated important monetarist and new classical ideas into Keynesian economics. Second, developments in the 1980s and 1990s shook economists’ confidence in the ability of the monetarist or the new classical school alone to explain macroeconomic change. 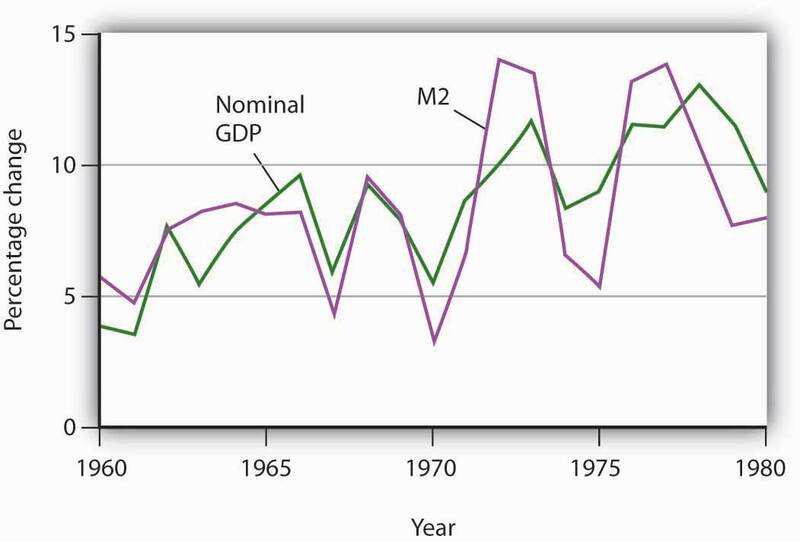 Look again at Figure 17.8 "M2 and Nominal GDP, 1960–1980". The close relationship between M2 and nominal GDP in the 1960s and 1970s helped win over many economists to the monetarist camp. 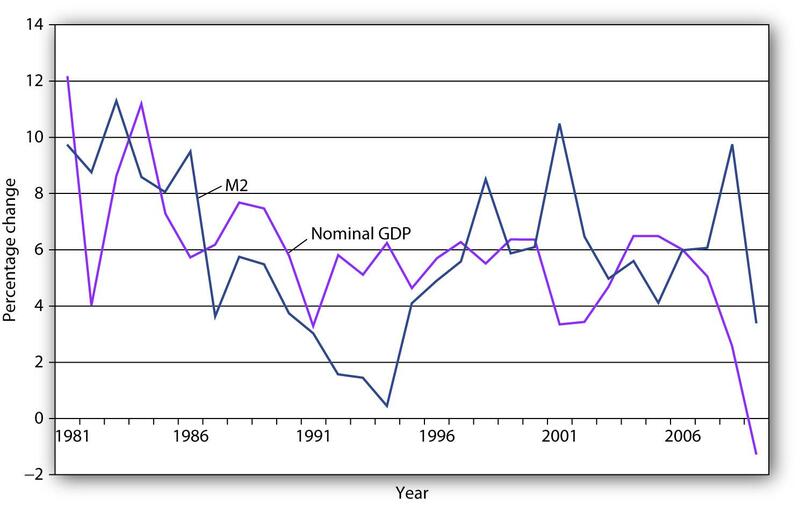 Now look at Figure 17.13 "M2 and Nominal GDP, 1980–2009". It shows the same two variables, M2 and nominal GDP, from the 1980s through 2009. The tidy relationship between the two seems to have vanished. What happened? The close relationship between M2 and nominal GDP a year later that had prevailed in the 1960s and 1970s seemed to vanish from the 1980s onward. The sudden change in the relationship between the money stock and nominal GDP has resulted partly from public policy. Deregulation of the banking industry in the early 1980s produced sharp changes in the ways individuals dealt with money, thus changing the relationship of money to economic activity. Banks have been freed to offer a wide range of financial alternatives to their customers. One of the most important developments has been the introduction of bond funds offered by banks. These funds allowed customers to earn the higher interest rates paid by long-term bonds while at the same time being able to transfer funds easily into checking accounts as needed. Balances in these bond funds are not counted as part of M2. As people shifted assets out of M2 accounts and into bond funds, velocity rose. That changed the once-close relationship between changes in the quantity of money and changes in nominal GDP. Many monetarists have argued that the experience of the 1980s, 1990s, and 2000s reinforces their view that the instability of velocity in the short run makes monetary policy an inappropriate tool for short-run stabilization. They continue to insist, however, that the velocity of M2 remains stable in the long run. But the velocity of M2 appears to have diverged in recent years from its long-run path. Although it may return to its long-run level, the stability of velocity remains very much in doubt. Because of this instability, in 2000, when the Fed was no longer required by law to report money target ranges, it discontinued the practice. New classical economics suggests that people should have responded to the fiscal and monetary policies of the 1980s in predictable ways. They did not, and that has created new doubts among economists about the validity of the new classical argument. The rational expectations hypothesis predicts that if a shift in monetary policy by the Fed is anticipated, it will have no effect on real GDP. The slowing in the rate of growth of the money supply over the period from 1979 to 1982 was surely well known. The Fed announced at the outset what it was going to do, and then did it. It had the full support first of President Carter and then of President Reagan. But the policy plunged the economy into what was then its worst recession since the Great Depression. The experience hardly seemed consistent with new classical logic. New classical economists argued that people may have doubted the Fed would keep its word, but the episode still cast doubt on the rational expectations argument. The public’s response to the huge deficits of the Reagan era also seemed to belie new classical ideas. One new classical argument predicts that people will increase their saving rate in response to an increase in public sector borrowing. The resultant reduction in consumption will cancel the impact of the increase in deficit-financed government expenditures. But the private saving rate in the United States fell during the 1980s. New classical economists contend that standard measures of saving do not fully represent the actual saving rate, but the experience of the 1980s did not seem to support the new classical argument. The events of the 1980s do not suggest that either monetarist or new classical ideas should be abandoned, but those events certainly raised doubts about relying solely on these approaches. Doubts about Keynesian economics raised by the events of the 1970s led Keynesians to modify and strengthen their approach. Perhaps the events of the 1980s and 1990s will produce similar progress within the monetarist and new classical camps. While there is less consensus on macroeconomic policy issues than on some other economic issues (particularly those in the microeconomic and international areas), surveys of economists generally show that the new Keynesian approach has emerged as the preferred approach to macroeconomic analysis. The finding that about 80% of economists agree that expansionary fiscal measures can deal with recessionary gaps certainly suggests that most economists can be counted in the new Keynesian camp. Neither monetarist nor new classical analysis would support such measures. At the same time, there is considerable discomfort about actually using discretionary fiscal policy, as the same survey shows that about 70% of economists feel that discretionary fiscal policy should be avoided and that the business cycle should be managed by the Fed.Dan Fuller and Doris Geide-Stevenson, “Consensus among Economists: Revisited,” Journal of Economic Education 34, no. 4 (Fall 2003): 369–87. Just as the new Keynesian approach appears to have won support among most economists, it has become dominant in terms of macroeconomic policy. Did the experience of the 2007-2009 recession affect the views of economists concerning macroeconomic policy? One source for gauging possible changes in opinions of economists is the National Association For Business Economics twice yearly survey of economic policy.National Association for Business Economics, Economic Policy Surveys, March 2009 and August 2010. Available at www.nabe.com According to the August 2010 survey of 242 members of NABE, almost 60% were supportive of monetary policy at that time, which was expansionary and continued to be so at least through 2010. Concerning fiscal policy, there was less agreement. Still, according to the survey taken at the time the 2009 fiscal stimulus was being debated, 22% characterized it as “about right,” another third found it too restrictive, and only one third found it too simulative. In the August 2010 survey, 39% thought fiscal policy “about right,” 24% found it too restrictive, and 37% found it too simulative. Also, nearly 75% ranked promotion of economic growth more important than deficit reduction, roughly two thirds supported the extension of unemployment benefits, and 60% agreed that federal assistance funds to states from the 2009 stimulus package was appropriate. Taken together, the new Keynesian approach still seems to reflect the dominant opinion. The actions of the Fed starting in late 1979 reflected a strong inflation constraint and a growing recognition of the impact lag for monetary policy. Reducing the deficit dominated much of fiscal policy discussion during the 1980s and 1990s. The events of the 1980s and early 1990s do not appear to have been consistent with the hypotheses of either the monetarist or new classical schools. New Keynesian economists have incorporated major elements of the ideas of the monetarist and new classical schools into their formulation of macroeconomic theory. In both cases, consider both the short-run and the long-run effects. Imagine that you are driving a test car on a special course. 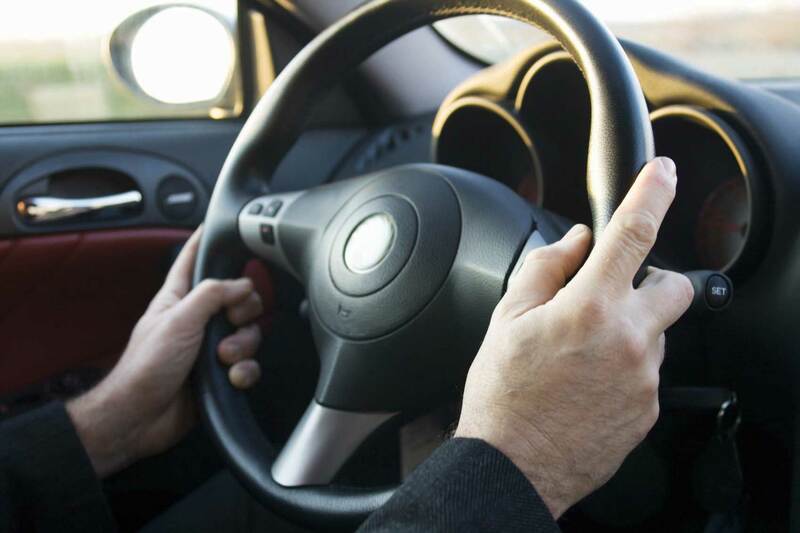 You get to steer, accelerate, and brake, but you cannot be sure whether the car will respond to your commands within a few feet or within a few miles. The windshield and side windows are blackened, so you cannot see where you are going or even where you are. You can only see where you have been with the rear-view mirror. The course is designed so that you will face difficulties you have never experienced. Your job is to get through the course unscathed. Oh, and by the way, you have to observe the speed limit, but you do not know what it is. Have a nice trip. Now imagine that the welfare of people all over the world will be affected by how well you drive the course. They are watching you. 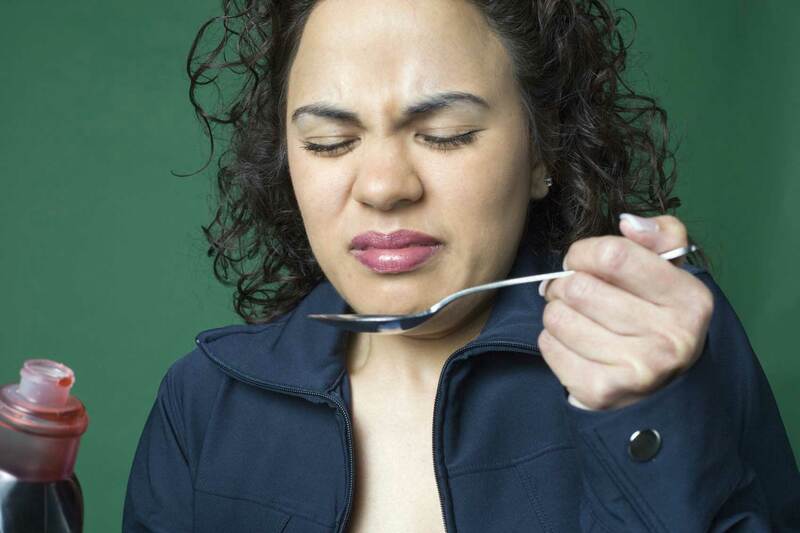 They are giving you a great deal of often-conflicting advice about what you should do. Thinking about the problems you would face driving such a car will give you some idea of the obstacle course fiscal and monetary authorities must negotiate. They cannot know where the economy is going or where it is—economic indicators such as GDP and the CPI only suggest where the economy has been. And the perils through which it must steer can be awesome indeed. One policy response that most acknowledge as having been successful was how the Fed dealt with the financial crises in Southeast Asia and elsewhere that shook the world economy in 1997 and 1998. There were serious concerns at the time that economic difficulties around the world would bring the high-flying U.S. economy to its knees and worsen an already difficult economic situation in other countries. The Fed had to steer through the pitfalls that global economic crises threw in front of it. In the fall of 1998, the Fed chose to accelerate to avoid a possible downturn. The Federal Open Market Committee (FOMC) engaged in expansionary monetary policy by lowering its target for the federal funds rate. Some critics argued at the time that the Fed’s action was too weak to counter the impact of world economic crisis. Others, though, criticized the Fed for undertaking an expansionary policy when the U.S. economy seemed already to be in an inflationary gap. In the summer of 1999, the Fed put on the brakes, shifting back to a slightly contractionary policy. It raised the target for the federal funds rate, first to 5.0% and then to 5.25%. These actions reflected concern about speeding when in an inflationary gap. But was the economy speeding? Was it in an inflationary gap? Certainly, the U.S. unemployment rate of 4.2% in the fall of 1999 stood well below standard estimates of the natural rate of unemployment. There were few, if any, indications that inflation was a problem, but the Fed had to recognize that inflation might not appear for a very long time after the Fed had taken a particular course. As noted in the text, this was also during a time when the once-close relationship between money growth and nominal GDP seemed to break down. The shifts in demand for money created unexplained and unexpected changes in velocity. The outcome of the Fed’s actions has been judged a success. While with 20/20 hindsight the Fed’s decisions might seem obvious, in fact it was steering a car whose performance seemed less and less predictable over a course that was becoming more and more treacherous. Since 2008, both the Fed and the government have been again trying to get the economy back on track. In this case, the car is already in the ditch. The Fed has decided on a “no holds barred” approach. It has moved aggressively to lower the federal funds rate target and engaged in a variety of other measures to improve liquidity to the banking system, to lower other interest rates by purchasing longer-term securities (such as 10-year treasuries and those of Fannie Mae and Freddie Mac), and, working with the Treasury Department, to provide loans related to consumer and business debt. Sources: Ben S. Bernanke, “The Crisis and the Policy Response” (speech, London School of Economics, January 13, 2009); Louis Uchitelle, “Economists Warm to Government Spending but Debate Its Form,” New York Times, January 7, 2009, p. B1. 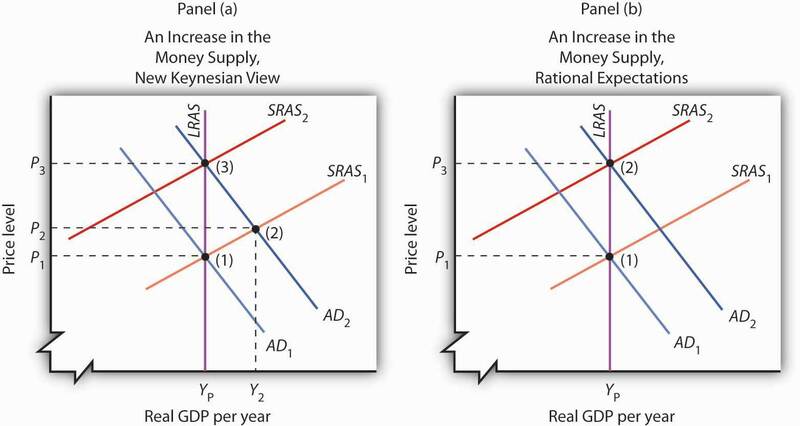 Panel (a) shows an expansionary monetary policy according to new Keynesian economics. 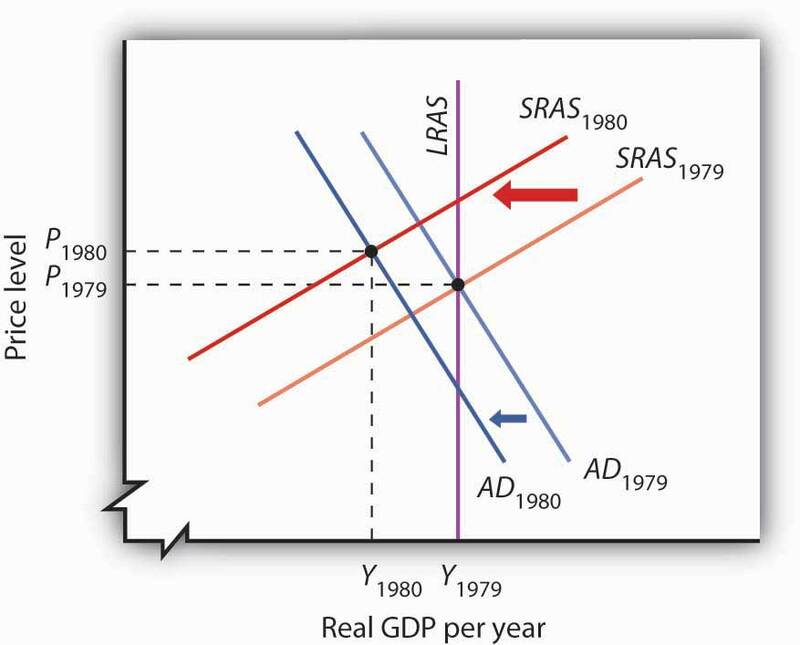 Aggregate demand increases, with no immediate reduction in short-run aggregate supply. Real GDP rises to Y2. In the long run, nominal wages rise, reducing short-run aggregate supply and returning real GDP to potential. Panel (b) shows what happens with rational expectations. When the Fed increases the money supply, people anticipate the rise in prices. Workers and firms agree to an increase in nominal wages, so that there is a reduction in short-run aggregate supply at the same time there is an increase in aggregate demand. The result is no change in real GDP; it remains at potential. There is, however, an increase in the price level. We have surveyed the experience of the United States in light of the economic theories that prevailed or emerged during five decades. We have seen that events in the past century have had significant effects on the ways in which economists look at and interpret macroeconomic ideas. Before the Great Depression, macroeconomic thought was dominated by the classical school. That body of theory stressed the economy’s ability to reach full employment equilibrium on its own. The severity and duration of the Depression caused many economists to rethink their acceptance of natural equilibrating forces in the economy. John Maynard Keynes issued the most telling challenge. He argued that wage rigidities and other factors could prevent the economy from closing a recessionary gap on its own. Further, he showed that expansionary fiscal and monetary policies could be used to increase aggregate demand and move the economy to its potential output. Although these ideas did not immediately affect U.S. policy, the increases in aggregate demand brought by the onset of World War II did bring the economy to full employment. Many economists became convinced of the validity of Keynes’s analysis and his prescriptions for macroeconomic policy. Keynesian economics dominated economic policy in the United States in the 1960s. Fiscal and monetary policies increased aggregate demand and produced what was then the longest expansion in U.S. history. But the economy pushed well beyond full employment in the latter part of the decade, and inflation increased. While Keynesians were dominant, monetarist economists argued that it was monetary policy that accounted for the expansion of the 1960s and that fiscal policy could not affect aggregate demand. Efforts by the Nixon administration in 1969 and 1970 to cool the economy ran afoul of shifts in the short-run aggregate supply curve. The ensuing decade saw a series of shifts in aggregate supply that contributed to three more recessions by 1982. As economists studied these shifts, they developed further the basic notions we now express in the aggregate demand–aggregate supply model: that changes in aggregate demand and aggregate supply affect income and the price level; that changes in fiscal and monetary policy can affect aggregate demand; and that in the long run, the economy moves to its potential level of output. The events of the 1980s and beyond raised serious challenges for the monetarist and new classical schools. New Keynesian economists formulated revisions in their theories, incorporating many of the ideas suggested by monetarist and new classical economists. The new, more powerful theory of macroeconomic events has won considerable support among economists today. “For many years, the hands-off fiscal policies advocated by the classical economists held sway with American government. When times were hard, the prevailing response was to tough it out, awaiting the ‘inevitable’ turnaround. The lessons of the Great Depression and a booming wartime economy have since taught us, however, that government intervention is sometimes necessary and desirable—and that to an extent, we can take charge of our own economic lives.” Evaluate the foregoing quotation based upon the discussion in this chapter. How would you classify the speaker in terms of a school of economic thought? In his 1982 Economic Report of the President, Ronald Reagan said, “We simply cannot blame crop failures and oil price increases for our basic inflation problem. The continuous, underlying cause was poor government policy.” What policies might he have been referring to? Many journalists blamed economic policies of the Reagan administration for the extremely high levels of unemployment in 1982 and 1983. Given the record of the rest of the decade, do you agree that President Reagan’s economic policies were a failure? Why or why not? The day after the U.S. stock market crash of October 19, 1987, Federal Reserve Board Chairman Alan Greenspan issued the following statement: “The Federal Reserve, consistent with its responsibilities as the nation’s central bank, affirmed today its readiness to serve as a source of liquidity to support the economic and financial system.” Evaluate why the Fed chairman might have been prompted to make such a statement. Compare the rationale of the Reagan administration for the 1981 tax reductions with the rationale behind the Kennedy–Johnson tax cut of 1964, the Bush tax cut of 2001, and the Bush tax cut of 2003. If the economy is operating below its potential output, what kind of gap exists? What kinds of fiscal or monetary policies might you use to close this gap? Can you think of any objection to the use of such policies? If the economy is operating above its potential output, what kind of gap exists? What kinds of fiscal or monetary policies might you use to close this gap? Can you think of any objection to the use of such policies? In General Theory, Keynes wrote of the importance of ideas. The world, he said, is ruled by little else. How important do you think his ideas have been for economic policy today? State whether each of the following events appears to be the result of a shift in short-run aggregate supply or aggregate demand, and state the direction of the shift involved. The price level rises sharply while real GDP falls. The price level and real GDP rise. The price level falls while real GDP rises. The price level and real GDP fall. Explain whether each of the following events and policies will affect the aggregate demand curve or the short-run aggregate supply curve, and state what will happen to the price level and real GDP. Using the model of aggregate demand and aggregate supply, illustrate an economy with a recessionary gap. Show how a policy of nonintervention would ultimately close the gap. Show the alternative of closing the gap through stabilization policy. Using the model of aggregate demand and aggregate supply, illustrate an economy with an inflationary gap. Show how a policy of nonintervention would ultimately close the gap. Show the alternative of closing the gap through stabilization policy.